After a relatively short two-year holding period, aircraft and truck component manufacturer Senior PLC has left my model portfolio. In this blog post I outline why I invested in the company in the first place and why I’ve decided to sell now, despite (or perhaps because of) recent share price gains. Senior PLC designs and manufactures components and systems for original equipment manufacturers (OEMs) such as Boeing, Rolls Royce and Caterpillar. The company is focused on two main areas: aerospace and land vehicles. In aerospace it has products in virtually every commercial and military aircraft, while in land vehicles it’s the world’s largest manufacturer of flexible automotive components, primarily in diesel engines. Senior has been successful over a very long period of time, but in 2016 the company was struggling. In fact, it had been struggling for a couple of years. This was largely due to the negative effect falling commodity prices were having on the oil and gas-related North American heavy-duty and off-highway truck markets. Normalised net profits fell from £71m in 2014 to £50m in 2016 and there was no recovery in sight. 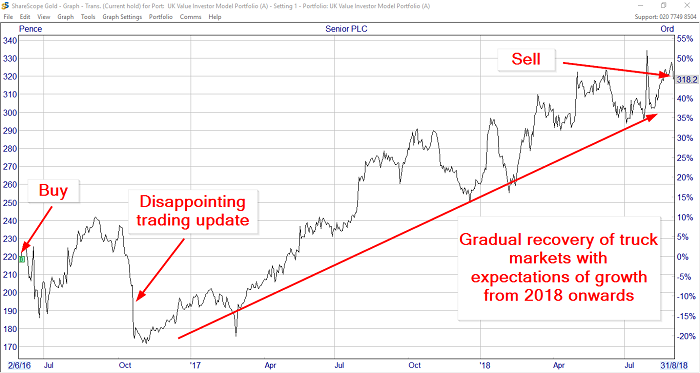 As you might expect, the market was not exactly overjoyed at this situation and Senior’s share price collapsed by more than 50% from 350p in 2015 to about 170p in late 2016. However, to me Senior looked like a high quality business suffering from a short-term cyclical downturn. Senior quickly recovered from a short-term cyclical setback, exactly as it said it would. Note: If you’d like to read the full pre-purchase review (taken from the June 2016 issue of my monthly newsletter) you can download it here (PDF). An above average balance sheet, with debts of less than three-times earnings. Despite this impressive track record, Senior was trading at only a slight premium to the market. For example, its PE10 ratio was slightly above the market average at 15.9 compared to the FTSE 100’s 14.8. And while Senior’s dividend yield was less than the FTSE 100’s 4.0%, it was still reasonably healthy at 2.9%. I wouldn’t call that an obvious bargain, but perhaps it was it was if you took into consideration Senior’s other attractive features, such as its growth rate, consistency, profitability and market-leading positions. So why would the stock market offer up such a good company at such a potentially attractive price? The answer can be found in the short-term mindset of most active investors. 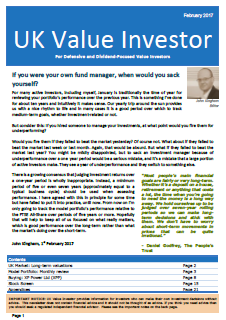 Active investors drive the market, and for the most part these investors have a short-term mindset. They respond to today’s news, buying on good news and selling on bad news. This short-termism means that good companies (like Senior) can see their share prices collapse (implying that the long-term cash returns of the business have probably collapsed) just because they face a short-term and relatively minor headwind (such as a temporary slowdown in the off-highway truck market). Short-termism is bad news for the efficient market theory, but it’s good news for investors who focus on the long-term. That’s because long-term investors can occasionally snap up good companies at irrationally low prices. Of course, there are no guarantees that these investments will work out well, but they frequently do. Senior joined the model portfolio at 219p per share, down almost 40% from its 2015 high of around 350p. But that wasn’t the low point. Having bought the shares, they staged a slight recovery and then collapsed by more than 20% to 170p following a negative trading update. And what major event happened to make investors think Senior’s value should decline by 20%? Note that it says “lower”. Not “materially lower” or “significantly lower”; just “lower”. But “lower” expected profits was still enough to push the share price down by another 20%. If I’d used a typical 20% stop loss then the portfolio’s investment in Senior would have ended after just a few months with little to show for it except a 20% capital loss. Fortunately I don’t use stop losses because I don’t agree with the idea of selling a company just because it’s share price has fallen by 20% or so. Okay, I can understand wanting to review an investment if it falls by 20% or more, but to sell automatically? That seems like madness to me, but each to their own. When Senior’s 2016 annual results eventually came out, they weren’t that bad after all. Revenues were up 8%, EPS was down 6%, but the dividend was still covered almost twice over so the dividend actually went up by 6%. Instead of trying to please investors with fairy tales of a rapid turnaround, Senior’s management said that 2017 would be worse than 2016. They also pointed out that the slowdown in truck markets would inevitably be cyclical, and that any deferment of truck purchases or maintenance (both of which require Senior components) would have to be caught up with by the oil and gas industry at some point (i.e. 2018 and beyond). Amazingly enough, this went down well with investors and the share price went up by almost 20% over the following month. 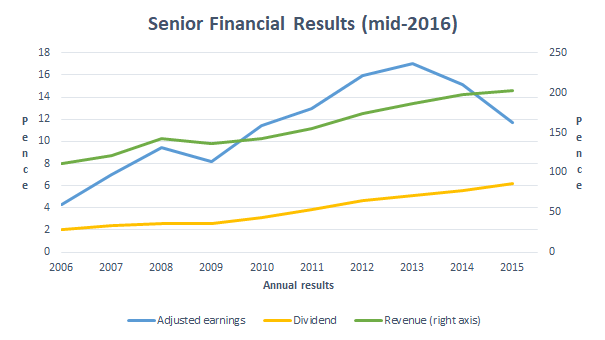 I guess the dividend increase had something to do with that, but the 2016 annual results marked the end of the market’s pessimism towards Senior. After that, Senior’s forecast for a recovery in its off-highway truck markets was more or less spot on. The Flexonics division gradually recovered and the company’s 2017 results showed upward progress once more. As it became clear that the downturn in Senior’s truck-related end markets was cyclical and short-term, investors began to push the share price back up. I expect the combination of a 3%+ dividend yield, a long-term double digit growth rate and a positive recovery story was just too much to resist. And while this price recovery may be rational, it does make Senior a less attractive investment because it reduces the investment’s margin of safety. By margin of safety I mean how far the market value is below the company’s ‘intrinsic’ value (think of the intrinsic value as the value you would assign to the shares if you were some sort of all-knowing super being). The margin of safety is important because it affects how wrong you can be and still make a reasonable return. 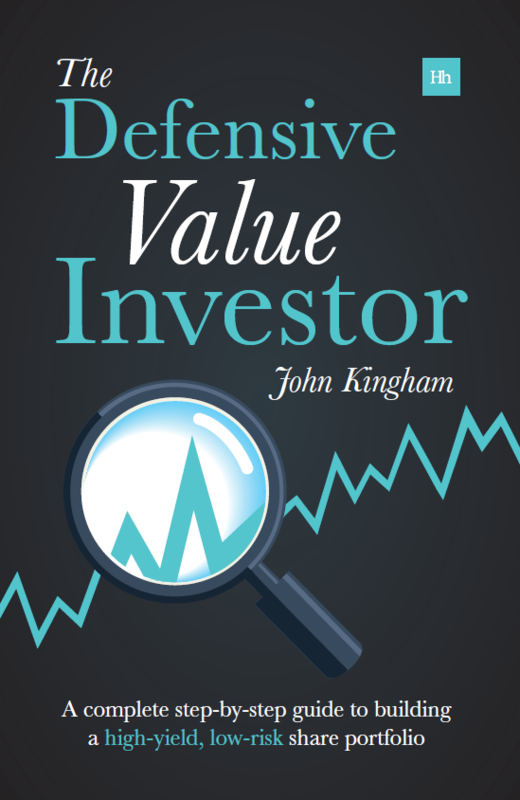 For example, if you pay a high price for a company and get a low dividend yield, you’ll probably require a high dividend growth rate to offset that low dividend yield. But if that high dividend growth rate has only a 5% chance of occurring, you’re very likely to be disappointed. On the other hand, if you pay a low price for a company and get a high dividend yield, then you can probably achieve a satisfactory return with a lower dividend growth rate. That lower growth rate may have a 95% chance of occurring, in which case you’re very likely to be satisfied. What does all of this have to do with Senior? Well, in my opinion Senior had a very good chance of outperforming the market when it joined the model portfolio in 2016. It had a near-3% dividend yield and a historic growth rate of around 12%. But today, Senior’s dividend yield is only just above 2% and its growth rate has fallen from 12% to 8% (thanks to the cyclical decline that scared away so many short-term investors). For me, this means the odds of Senior out-performing over the medium to long-term are now (probably) much lower than they were in 2016. 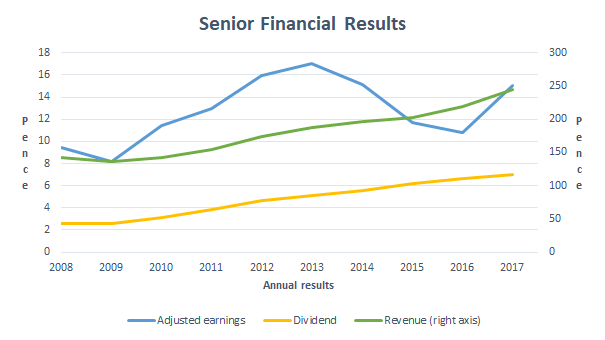 So despite the fact that I like Senior and still think it’s an excellent company, it’s higher price, lower growth rate and lower dividend yield (and lower rank on my stock screen) are enough to make me want to sell. And that’s exactly what I’ve done. I sold the shares at a price of 314p per share and, as usual, the proceeds will go into a new holding in next month. If that new investment performs even half as well as Senior then I’ll be reasonably satisfied. John, Looks like a good move – goodbye to the old senior and hello to young (ish) Ted Baker. I think I anticipated this one in a recent post. If you have risk on your radar, WMH will probably replicate the rise in Senior once it’s US operation gets traction. Hi LR, yes you did mention Senior recently. It’s a good company but everyone now agrees and so the price (sadly) reflects that rose-tinted world-view. John – To be honest, WMH is definitely a bit of a flutter on the dire situation and write down it has just suffered — It’s cloth cap shops have taken a beating because of the Fixed Odds Betting Terminals restrictions by the government. This write down has put paid to much of the company’s real equity, however, in the US WMH is considered a bit of a gold standard and it’s existing business (been in the US a good few years now) is growing OK – the real opportunity is the recent legalisation in the US of online gambling and the deal signed with Eldorado and several large outfits. The online in the US is potentially massive, dwarfing anything here in Blighty – It’s not for widows and orphans mind and I suspect it’d fail many of your rightly selected cautionary tests – but sometimes gut feel works pretty well and I think this has recovery written all over it. Must confess to having bought and sold this several times over the years and fortunately been on the right side of the trade – oohps mustn’t speak too soon. So far up 3.5% in a week – we’ll see how it goes and I only have the t-shirt on it, not the full longsleeve.